I still love Haytham Kenway, though. This had the makings of a great game. A fascinating period of history, the American Revolution, to tap into. A half-English, half-Mohawk lead character swept up in a bloody war between proud natives and imperial invaders. Exploring Boston, New York City, and the wild frontier. Hanging out with George Washington and riding with Paul Revere. But when the game was released in the winter of 2012, it sadly failed to live up to the promise of the setting. Despite having an interesting past and a compelling stake in the world, hero Connor is a charisma vacuum. Stoic, sullen, and hard to love, he's the polar opposite of the previous games' beloved Ezio Auditore. He's dry, self-serious, and humourless: all traits that can be applied to the game itself. The only real spark of wit and charisma is his father, Haytham Kenway, who you play as in the game's extended prologue. If only he was the star. Then there's the heavily scripted mission design. Most AC games are guilty of relying on insta-fails, but they're so rife here that half the time you barely feel like you're playing it at all. If you dare to try and solve a problem creatively, or take a route through the world the developers don't want you to, it's often a game over. This leaves you feeling stifled, like you're jumping through hoops for the level designers rather than really engaging with anything. The setting, although beautiful at times, is actually a bad fit for an Assassin's Creed game. Boston and New York, being relatively new cities at the time the game is set, don't have many tall buildings to climb and navigate with. It's mostly short wooden houses, with none of the vast, dramatic architecture of other games in the series. Even the historical figures you meet are pretty dull—especially compared to the fun cameos from the Ezio games. The stealth, even though it's a major part of the game, is terribly clunky and limited. The sidequests are mostly tedious, particularly the ones involving chasing pieces of fluttering paper around. The homestead, a ranch that can be upgraded, is a neat idea, but ultimately undercooked. And the story feels curiously unfinished, with a lot of long-winded narration seemingly making up for narrative elements that were cut or never written. It's not terrible or broken; just deeply underwhelming, and a step back. 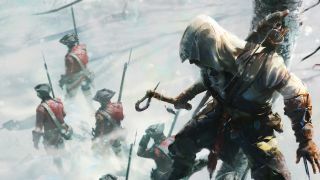 Fast forward six years and Ubisoft has just released a remastered version of Assassin's Creed 3, which comes bundled with all the DLC and Liberation, a spin-off set in New Orleans that was originally released for the PlayStation Portable. Yes, really. It's a hefty package, but does it fix any of the problems that blighted the original release? Well, some of them, a little. But for the most part the game's many issues are so deeply ingrained that no amount of remastering, short of a total Resident Evil 2-style remake, could fix them. The most important change is to the stealth. You can now whistle to lure enemies while hiding in bushes, and take down two at once with a swift double assassination. Small changes, really, but the result is a game that is generally less frustrating. Some mission objectives have been adjusted to be less punishing also: evidence that this is more than just the same game upscaled. Speaking of shiny things, the remaster looks a little prettier too. Softer shadows, more natural lighting, and warm, gold-tinged colour grading have given the visuals a boost, which is particularly evident in the sun-dappled, snow-covered forests of the frontier. However, some details such as character's faces feel, oddly enough, less detailed. A side effect of the new lighting, perhaps, rather than any kind of texture downgrade. But it's difficult to say for sure. It's no Odyssey, but it's way more handsome than it was six years ago. Ultimately, AC3 catches the series in a moment of awkward transition. This was the last of the old guard, before Black Flag swept in and changed the way we think about the series: a decision that would eventually lead to the massive Witcher-style RPG that is Odyssey. It's a slow, clumsy game with a lot of creaky set-pieces. The combat feels like you're chaining slick animations together rather than actually fighting. And the story is mostly forgettable, despite having a few standout moments such as the Battle of Bunker Hill. I was open to giving Assassin's Creed 3 another chance, wondering if time might have been kinder to it than my memories. But all this remaster has done is hammer home the fact that, in the pantheon of the series, this is undoubtedly the weakest link. It's also clear that this remaster was developed primarily for consoles, because honestly, it looked good enough on PC as it was. But hey, if you really feel the need to experience Connor's adventure again, this is a chance to do it with a sprinkling of new features and visual tweaks.